An excursion surrounded by nature, the true protagonist of this tropical island - from the heavenly lush vegetation of the Konoko gardens to the famous Dunn's River Falls, where we can test our physical ability with a thrilling climb. We leave the dock behind and start our sightseeing tour towards Ocho Rios as far as the city’s most recent attraction - the Konoko gardens. “Coyaba” is a Taino term that means “”heaven” and, in fact, this garden is a true heaven, with paths passing through lush gardens, where carp, and turtles swim in its streams and ponds. An expert guide awaits us to take us on a tour of the gardens, where we will see exotic flowers shaded by enormous cedar and banyan trees. A hectare of lush tropical vegetation and a mountain stream constitute the backdrop of the Konoko museum, opened in a Spanish-style building complete with a courtyard and fountain. It even displays artefacts dating back to the pre-Columbian period that tell the story of the island to the present day. The last stop on our tour are the world-famous Dunn's River Falls, where we can admire the water falling from enormous rock terraces. An expert guide will assist us during a thrilling climb of 180 metres up to the top. Before returning to the port, we will have some time for shopping. The order of the visits may be subject to change without compromising the programmed visits. For participants who wish to climb Dunn's river falls, we recommend wearing sturdy shoes with rubber soles or that you bring a spare pair of shoes with you. It is not mandatory to buy rubber shoes. 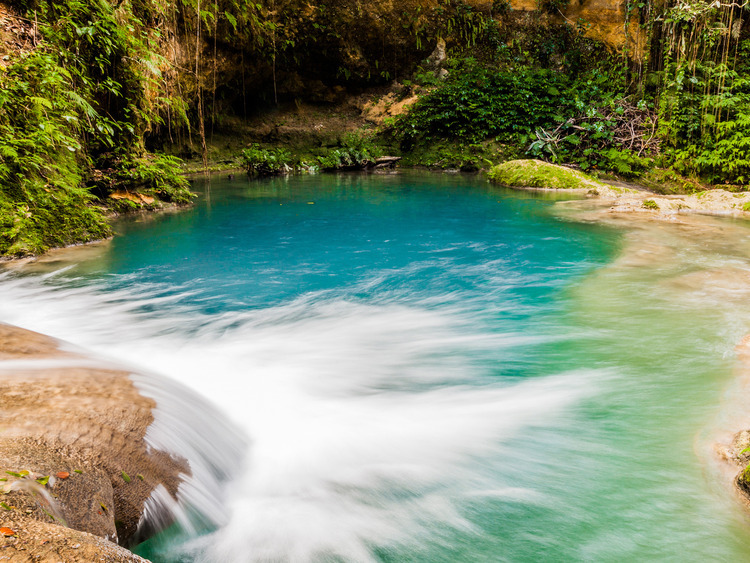 It is possible to hire rubber shoes and lockers (not included in the price of the excursion) directly at Dunn's River Falls.